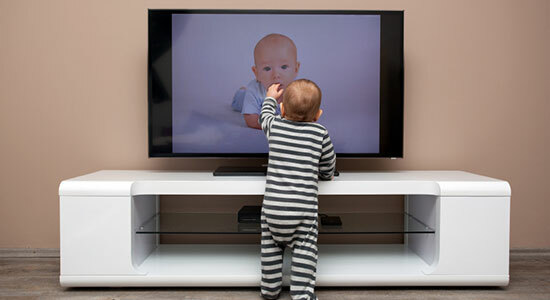 After a string of TV tip-overs in the Chicago area left four children dead and one injured during only a four month period, safety advocates began a study of TV-related child injuries. Statistics from the study are shocking, and, sadly, preventable. The study found that from 1990-2011, 400,000 children suffered from TV-related injuries in the US. Each year, more than 17,000 children go to emergency rooms for TV-related injuries--one every 30 minutes. According to the study, 70 percent of incidents involve children under the age of five, making the youngest children the most vulnerable. One problem that may cause so many TV tip-overs is the current transition from older, bulky TVs to newer, flatter models. When a new TV is purchased, the older TVs are often stored on unsafe surfaces in an out-of-the-way location, like a dresser in the basement, and these locations can contribute to deadly falls. But flat-screen TVs aren't necessarily safer--they're lighter and less bulky, which actually makes them much easier to tip. Safety advocates insist that all TVs are hazards until they're anchored down, which is something only one in four adults take the time to do. To help reduce more preventable injury, testers recommend greater public education, the development of safety standards, and the inclusion of safety anchors with each newly purchased TV, but until new regulations are put into practice, there are ways to prevent a TV tip-over. Securing TVs to platforms or walls using safety straps, L-brackets, and wall mounts is the most effective way to prevent injury, but keeping TVs off of unsafe platforms like dressers, armoires, and chests of drawers is also important. You should also never place toys or remotes on top of your TV, as this may encourage your child to reach against the TV and cause it to fall. If you, or someone you love, suffered injuries caused by an unsafe product, you may have a case, and you need to learn your legal rights. At Edgar Snyder & Associates, we have the experience and resources necessary to gather evidence, collect medical records, speak with experts, and help to get you the compensation you deserve. Call us now at 1-866-943-3427 or fill out the form at the top right of this webpage for a no obligation, free legal consultation. Call us now--our phones answer 24/7. "Study prompted by Chicago deaths highlights dangers of TV tip-overs." Chicago Tribune. July 22, 2013. "TV Tip-Overs Fact Sheet." PreventChildInjury.org.